Abram Wall (right) with Brock University Dean, 3 June 1977. Abram A. Wall: immigration adviser and farmer; born 21 July 1902 in the village of Nikolaidorf, Molotschna Colony, Ukraine to Abram and Helena (Neufeld) Wall. He was the oldest child in a family of two sons and two daughters. In 1925 Abram married Emilie Ruppel (1906-25 March 1980), born in the village of Reinwald in Saratov, Russia, the daughter of Karl and Sophie Ruppel. Abram and Emilie had three sons and one daughter. Abram died 5 January 1986. For part of his childhood, Wall lived in a Mennonite Alternative Service Forestry Camp at which his father was administrator and chaplain. He received a good education and graduated from the School of Business and Commerce in Gnadenfeld, Ukraine. Soon after he began work as a bookkeeper in the local administration but the Russian revolution put an end to his career. After being baptized and becoming a member of the Landskrone Mennonite Church, Abram married Emilie Ruppel. On 26 September 1925, a month after their marriage, the young couple left Russia. They travelled via Southampton, England and St. John, New Brunswick, Canada to Namaka, Alberta, arriving there in December. The young couple struggled on their pioneer homestead but enjoyed close relationships with family and friends. Their sons: Abram Charles Wall (born 1926), Eldo John Wall (born 1928) and Arthur Edward Wall (born 1930), were born in Namaka. The depression of the 1930s and years of crop failures prompted them to move to Vineland, Ontario in 1938 and soon after, to a fruit farm near St. Catharines, Ontario. Their daughter Hedy (Wall) Brennan was born here in 1940 and here they lived until their retirement to St. Catharines in 1968. In 1947 Wall was elected chairman of the Ontario Mennonite Relief Immigration Committee and became a member of the Canadian Mennonite Board of Colonization. The primary mission of these boards was to facilitate the immigration of Mennonites, mainly from Russia. When the boards were dissolved in 1964 after the formation of Mennonite Central Committee (Canada), Wall continued this work on his own. He was eager to help others and grateful to Canada, the land that had treated his family and the Mennonites so well. 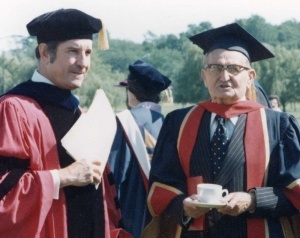 On 3 June 1977, Brock University bestowed upon Wall an honorary Doctor of Laws degree, in recognition of his contribution to the settlement of hundreds of individuals and families in Ontario, many of them Russian Mennonites. Wall was well known for his intellectual astuteness and wide knowledge of immigration procedures. Being fluent in German, Russian, Ukrainian and English, he used his persuasive skills in dealing with governments both in Canada and the Soviet Union. As noted in the citation for his honorary degree, Wall worked for over 30 years "helping to make a reality of the Canadian ideal of a cultural mosaic." In July 1985 Abram moved to the Orchard View Apartments in Vineland. He died 5 January 1986 after a short hospital stay. He loved God and was deeply committed to the church. Until his death, Abram remained part of the St. Catharines United Mennonite Church where he and his wife were devoted and faithful members for many years. "Abram Wall honored for humanitarian work, Honorary degrees came as surprise." St. Catharines Standard (1977). "Citation." Brock University Honorary Degree and Award Recipients, Spring Convocation 1977, Brock University, St. Catharines, Ontario. The Family. "Life Story of Abram A. Wall." Unpublished obituary at funeral, January 1986. Giesbrecht, John B. "Abram Wall dies at 83 years of age." St. Catharines Standard (January 1986). "Honorary degrees for naturalists, Mennonite official." St. Catharines Standard (1977). Jacobs, Linda. "Brock will Honor Him, He’s great red tape snipper." St. Catharines Standard (1977). Jantzen, Erica. "Wall, Abram A. (1902-1986)." Global Anabaptist Mennonite Encyclopedia Online. November 2011. Web. 20 Apr 2019. http://gameo.org/index.php?title=Wall,_Abram_A._(1902-1986)&oldid=154355. Jantzen, Erica. (November 2011). Wall, Abram A. (1902-1986). Global Anabaptist Mennonite Encyclopedia Online. Retrieved 20 April 2019, from http://gameo.org/index.php?title=Wall,_Abram_A._(1902-1986)&oldid=154355. This page was last modified on 18 September 2017, at 19:39.